This second part in a series on training for legal translators looks at what you need to study first. See the first post here. The first thing you need as a legal translator is at least a rudimentary knowledge of the two major legal traditions, civil and common law. You need to know how they work and differ. This is especially important if you translate across the civil–common law divide, e.g., from a continental European language into English or the other way. But even if you translate between two legal systems of the same tradition, knowing the main characteristics of both traditions is still useful. After all, neither tradition exists in a vacuum, and you will recognise elements of each in most legal systems. This is even truer today, given the long-running, and continuing, trend of the legal systems of each tradition of adopting the strengths of the other tradition (Merryman and Peréz). Whereas civil law systems seem abstract, theoretical, scientific and rigid, common law is an ad hoc mass of principles and case law. Common law systems are more flexible, practical and organic, but they lack the symmetry and design of continental systems. While this feeling may seem a silly thing to be pointing out, noticing it can help. Especially, I’ve found, for understanding tricky patches of text in my source legal language, Spanish. Because not only are civil law systems (Spanish being one of them) abstract and theoretical, so is the language used to create and articulate them. Systems, after all, are just a collection of words. I’ve found that getting used to the abstract and theoretical nature of the system and the language gives you a leg up when working out what’s going on in source documents. Of course, other civil law systems may not have the feel I described above. I might be attributing a system characteristic to the tradition. However, just by knowing the traditions and your system, you will be able to uncover some underlying nature. Even if it isn’t the one I’m putting forward here. And this insight will help you better understand your source legal language. Knowing the traditional leaning of your legal systems can also help you in more practical ways. For instance, given the codified nature of civil law, you can rely more heavily on the legislation of civil law systems for understanding legal terms. So, for civil law terms, you’ll have less need for monolingual legal dictionaries than for common law terms. You’ll also know where to look first. You also need to learn about the legal systems you translate from and to. From my experience, I’d say you need to know more about your source rather than your target legal system. I came into legal translation with only lay knowledge of both my source and target systems. But I’ve always found it more useful to learn about my source legal system, Spain’s. Now you could say this is because I had a wealth of passive knowledge on common law, having grown up in Australia. But I don’t think that’s why. For one thing, when I started to specialise in legal translation, I probably knew more about the Spanish legal system than England and Wales’s, which, for translation purposes, is my target system. After all, I’d lived in Spain for over 10 years at that time. I at least knew more about the workings of the Spanish system; if not the underlying principles, some of which I resisted as counterintuitive when I first studied Spanish law. Either way, I’ve always got much more return from studying my source rather than my target system. Even though I never had any deep knowledge of my target system to begin with. I imagine this would be even more the case if you’re starting out with expert knowledge in your target system. Thus, you’ll probably get more bang for your buck by studying your source legal system. You may not even have to study your target system in much detail at all, but more on this in the next section. I found you look out for different things when learning about your source versus your target system. I noticed this when I did my MA in legal translation. As I was already a translator, I knew what I needed to listen out for to become a better legal translator. In Spanish law lectures, I concentrated on the content. The substance and details were what mattered. I tried to note the definitions of and the context for all the terms talked about in lectures, no matter how specific. Any of these terms could come up in a translation, so this information could prove useful. In contrast, when it came to English law, I zeroed in on how the lecturer talked about the law, ignoring the intricacies of the English system. I simply didn’t need these details to do my job. General principles and terms were important, but I switched off whenever we went any deeper. With English law, it was the language that mattered. So my ears pricked up when I heard phrases like, “to serve a claim on somebody”, “the court held”, “the company’s objects are”, “full and frank disclosure” and “set aside an order”. I could use these expressions in translations. Hearing about the decisions and statutes that created the law was anecdotal for my purposes. Thus, I needed the details of Spanish law (my source system) to better understand what I was translating and the language of English law (my target system) to better render the translation. Even the style of the lecturers told me a lot about how the Spanish and English systems differed. The Spanish lectures were all structure and abstraction. At the start of every class, the lecturer referred to the same diagram that mapped out the different areas of Spanish law and told us which part of the map we’d be looking at. It seemed a precise science — theoretical, precise, rigid and top-down. English law was a patchwork quilt in comparison. Don’t get me wrong, the lectures had a rhyme and reason to them, and they were entertaining. But they were based around quotes, cases, the names of acts and anecdotes. You could make out principles, but less so an underlying framework. This goes back to what I was saying about the different feel you get for the two legal traditions. I got these impressions from lectures on a course I did. But you can get similar impressions, and can learn similar things, from any monolingual resources about your source and target legal systems. So do study your legal systems, but study them in a way that serves your purpose of translating. Focus on the content of your source system and the language of your target system. 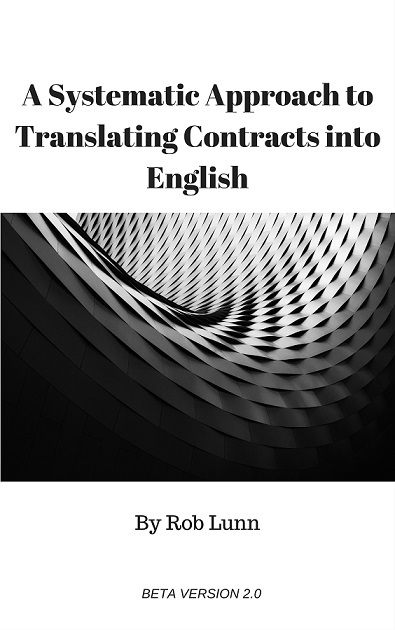 Posts related to Training for legal translators. Part II. Where to start.